Summary: We mock China for their over investment in infrastructure. Gleaming new factories, high-speed trains, subways. Foolish ants. Exceptional America does it better. As a third in this series, we look at some pictures of how much America invests in itself. These are snapshots, not a comprehensive assessment. Still, they tell a chilling story. We can fix this; it takes only our wisdom and will to do so. Probably new leaders, too. These graphs show totals as a per cent of GDP. All of the investment graphs show declines. 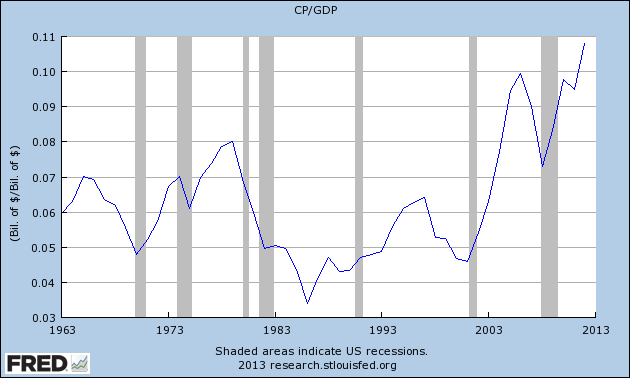 The growth and level of US corporate profits are exceptional. What did the CEOs’ cut to produce these profits? Among other things, wages and investment. It’s the sort of short-term thinking that has come to characterize American business. It produces a lavish bloom of profits, but long-term decay for America. This does not include overseas investment by US businesses. A nation works only as well as its public infrastructure. Let’s hope elves come to fix ours tonight. We’re still living off the infrastructure investments of the 1930s and 1955-1970 eras. Visitors to America often remark about our decrepit third-world-like infrastructure. The recession provided an opportunity to fix that, borrowing at low rates to inexpensively rebuild infrastructure using unemployed workers. We blew it, investing instead in war (e.g, the F-13, conflicts in Iraq and Afghanistan and a dozen other places). Previous Post Why do we pledge allegiance to a flag, ignoring the Founders’ instructions? Next Post “Ender’s Game” is a horror movie, showing us our dark side. No worries; we’ll forget faster than we eat the popcorn. Let’s tackle #4. Can we also have a graph of infrastructure investment by private parties? Can we not agree that government spending on infrastructure is often inefficient use of capital? The trend worldwide is towards privatization of infrastructure. Airports, ports, spaceports, roads, communication lines, and other projects are being privatized around the world allowing for a more efficient use of capital. The quickest way to increase infrastructure investment and R&D spending would be to adjust the tax code to incentivize the activity. No, we cannot. I know of no research showing that govt infrastructure spending is less efficient than private. No matter how often conservatives assert that, it’s ideology. Faith-based confidence by people who BELIEVE. As for using the tax code to incentivise, that’s proven to be quite inefficient. But it does contribute to the increased profit/gdp numbers, hence its popularity. Taken to extreme, such as Chicago’s privatized parking system, it is corruption-driven strip-mining of the public. Political and economic ideology are often very different from how things actually work in practice. The world is a complex place of unaccounted variables, unforseen conditions, and unintended consequences. If there is actually a case of public infrastructure investment being privatized in a way that was more beneficial to the public,, I would love to hear about it. You raise an important point. The great privatization stories — esp in Europe in the 1980s are of private industries — steel, chemicals, auto, etc. Many of these were great successes. Privatization of quasi-public services — mostly utilities — had a mixed record. The privatization of public services — parking, roads, prisons, schools — is on the whole horrific. Equal or worse service, small or no cost savings, massive corruption. The extreme example is health care. Medicare is far for cost-effective than private insurance, even with the ball and chain regulations Congress passed to funnel profits to politically powerful special interest groups (e.g., forbidding negotiation for lower drug prices). The right wing belief in the universal magic of markets results from decades of propaganda on gullible people. That is the real story here, and a depressing one. Here the timeframe is interesting, investments that are strategically useful may be better done as governmental spending. The task is to find fields were this easily be done. IMHO a useful starting point could be the German KfW programs (former Marshal plan funds), which are often highly efficient, e.g. the energy efficiency programs “recruit” three to five Euro private money per Euro given as long term credit and lead to the result that 90% of the new building are constructed much better than mandatory. Because many people/organizations do something does not necessarily mean it is in the long run the correct decision, often it is only politically more convenient in the short run. BTW in Germany the pendulum is swinging back in some fields like energy generation and transmission or health care. And, interestingly, Switzerland has on one hand low income tax but on the other huge governmental investments in infrastructure. Those interested in contrasting the relative efficiency of public vs. private investments can enjoy a real life case study going on right now: The Mexican Drug Cartels. Already, our energetic drug lords have co-opted massive segments of the Mexican economy, including substantial segments of its police, military, and prison systems – giving a whole new meaning to the term “public-private partnership”! Nor do drug lords rely upon various gimmicks so-called American capitalists use to rig the state to enforce their rights. They know how to get things done. ( But don’t loose your head ). So rejoice, free market advocates! Mexican drug lords are now striving to move to a place near you. And you will then be able to enjoy the fruits of your Social Darwinian vision! And for libertarians, we have the small state experiment in progress in Somalia. What a world of wonders. The tunnel, which zigzags the length of nearly six football fields, links warehouses in Tijuana and San Diego’s Otay Mesa industrial area. Authorities seized 8 1/2 tons of marijuana and 327 pounds of cocaine in connection with the tunnel’s discovery, according to court records. Given the cost of constructing US public infrastructure, that might have cost us $20 B to build. If Americans eventually give up smoking, snorting, and shooting illegal drugs, they can reboot as construction engineers. With a little work, that tunnel might become the start of a useful subway. Infrastructure spending will always be deficient with sprawl. Besides Feds spending on medicare/medicaid and defense. Everything else gets a smidgeon in budget. Have to cut defense in BIG way since country needs medicare/medicaid spending, especially with changing demographics. Infrastructure spending with housing sprawl in mind had excellent contribution to the economic activity. Downtowns were ever more pricier for housing so spreading to suburb was the result. Sprawl is also demanding more spending by households for maintenance so it demands more production of such aparatus. Problem of such sprawl is becoming clear now, it also, created more demand for energy which produced more pollution. Environmental problem is the only problem with sprawl. Maybe there is also speading up the depletion of the resources, but effect of that can be seen only farther in the future. We are nowhere near to the point of depletion of resources or the peak of it. Only peak depletion of the resource is in clean air. Besides the points of inflicting damadge to the Iraqis and Afghanistanis, our military, our people and our reputation in the world, which are the most important, does that mean that we “blew” our only chance at spending productively, or do we still have ability to spend more by borowing? Ok, there was additional wasting of material resources which were used for destruction instead of for production, but we still have plenty of resources, whether in human capital or in material resources or in financial capital. And it also created an irrational fear of deficits and public debt. But maybe, that will be beneficial in a way that created conversation about monetary system that might produce revealing informations. Maybe we will, as a nation, find out the true nature of the money, again. I did at least, thanks to the crash of the 2008. Without it, i would never study about economics and monetary systems. I have almost never heard a sugestion of how to get more employment that was bad, but rarely it was suggested on how to finance those projects. Where to get the money for making more jobs? One problem I think, Mr Maximus, is that many Americans, economists and politicians especially, seem to think that simple government spending of any sort on any kind of infrastructure or really anything at all, will always have the same effect of boosting our economy. In short, it seems to me that many Americans think our economy uses public money in the same way that a car uses fuel: it uses it simply to ‘go’. So we spend money, but without a specific plan and without any follow-through to make sure it is actually spent wisely. For example, let’s say our local government wants to build a bridge, or a sewer treatment plant, or whatever. We think the work will boost our economy. We might normally be correct, but then we don’t bother to do the hard part. First, we don’t do a cost-benefit analysis to see if it’s even worth it, and we don’t study options to see if it would be better at another scale, or another location. Then once it’s started, we don’ try to understand the project details, or to hire appropriate experts, or to properly incentivize the government contractor. We just spend the money and assume it will ‘go’. I don’t know why this is, but it’s eminently frustrating to me living in a region where I experience it first-hand. I can only guess that we just don’t care enough to try harder, or that we’re just not as smart as our overseas peers. Whatever the reason, I feel a big part of the problem is in our simple thinking, and our assumption that we are rich and smart, and so great things are easy for us, and don’t require much effort or consideration. As you said, “Exceptional America does it better”. You raise two points, conceptually distinct. (1). The fantastic cost of US infrastructure in the USA vs almost everywhere else in the developed world. Lots of evidence of this in both defense and civil spending. My guess is that it is just the strip-mining of public funds found in dysfunctional States. Nothing remarkable here. Everyone back to watching the game, or passing around the latest stories about BENGHAZI BENGHAZI BENGHAZI. That seems to imply that we spend money casually. 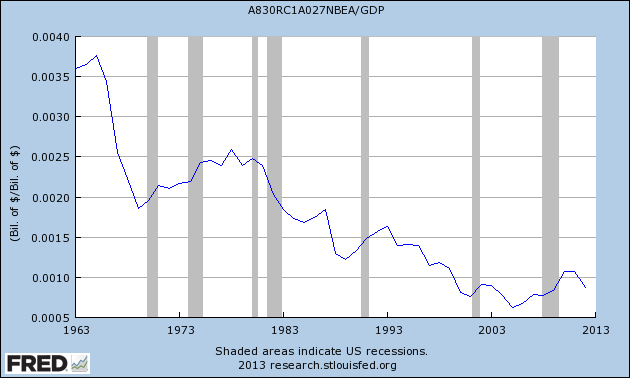 Since we spend quite little (ex-the defense gravy train), as the graphs here show, I doubt that is correct. So while there is of course wasteful infrastructure spending (e.g., in districts of powerful Congressmen or small States — like West Virginia in the reign of Senator Byrd), I suspect these are exceptions — not the rule. There is a 21st century infrastructure presently being built in America with private money that has no rival in any country, with the lone exception being China. It is the infrastructure of the internet, including its fiber backbone, wireless networks, data centers, cloud computing farms, etc. Google, Amazon, Facebook, Apple, Yahoo, EBay, Twitter, Netflix, etc. along with the Telcos are the ones financing this new infrastructure. Moore’s law is what keeps this investment contained as a % of GDP — it is an investment that scales in output exponentially with linear increases of input costs like labor and energy. This is dramatically different from previous capex/infrastructure booms such as the national highway system (public financed) or railroads (privately financed). I’m in the wireless industry, and I have offices and regularly do business in Europe, China, and India. China obviously has the largest capex/infrastructure boom (supposedly FDI >30% of GDP), probably to the point of being unhealthy, but it is truly first-rate when it comes to building/roads/transport as well as its IT backbone. India is another story. Our offices in Bangalore have always required back-up generators on every building we’ve ever leased. The power cuts out on a daily basis. Roads are a mess. This is not just a function of India’s high growth — it’s been this way for 15 years. In contrast, I’ve always found India’s IT infrastructure to be very good if not world class. Europe’s roads/transport/etc are good (better than U.S.) but their IT infrastructure is inferior to the US, and in my experience China/India as well. Fifteen years ago, Europe had the world’s most advanced wireless networks, now that leadership has been handed over to the U.S. You can see many of Europe’s tech giants on a long march to irrelevance. Nokia/Ericsson/ST/Siemens/Infineon — these were tech leaders in the 90s and 00s. Now they fade as Chinese players like Huawei/ZTE/Lenovo/Xiaomi rise to take their place along side the US tech titans. China at least has Baidu, Alibaba and a few others to challenge Google, etc. — Europe isn’t even on the playing field. America has clear leadership in this 21st century infrastructure. 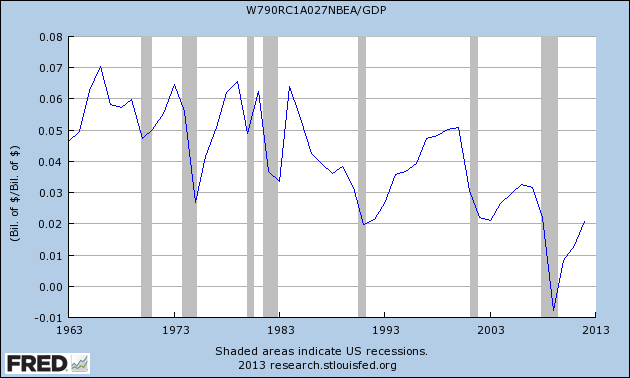 What that means for employment, wages, corporate profits, etc. is another matter. Can you provide cites for your claims? I’d esp like to see comparison of US e-infrastructure vs that in East Asia — more likely to be our top competitors in the 21st C (guessing). Also, while I am second to none in our obsession with all things electronic, you hit an important note in your last sentence. Transportation, water & sewage, and a hundred other factors also have large effects on our competitiveness and quality of life. More broadly, our national infrastructure to handle weather is grossly inadequate. Normal weather within 100-year ranges will devastate the US. New York is barely above sea level. Miami is, like New Orleans, smack on the hurricane highway. We’ve build countless communities on sandbars (i.e., barrier islands) that will be washed away by inevitable storms. Much of the SW is certain to be devastated by normal droughts (more so on a 200-300 scale incidence). Obama’s new Executive Order, while conceived to fight climate change that might not happen (and is not strongly forecast by the IPCC) is extremely necessary. If it take the climate doomsters to impel us to action, than that will offset a fraction of the damage they might have caused (depending on climate change during the next several decadees). Late reply on citations, but here are a few none-the-less. Sorry, no links. I think all of these sit behind subscriber portals. “Majority of China Mobile’s 1H13 Capex was spent on 3G. My note — this is an example of China’s mobile network being ~4 years behind the U.S. Korea and Japan were about the same time as US. Europe continues to lag US/Korea/Japan. I don’t have a good summary for it in any of the research available to me, but I know the infrastructure spending of Amazon, Google, Apple, Facebook, Netflix, Ebay, Twitter, etc. absolutely dwarf the spend of Baidu, Alibaba, Weibo, etc. I realize these are not the most impressive list of citations. I get bombarded with industry research reports, and I’m happy to pass along reports when/as I receive ones with good global overviews/summaries. A lot would be different today with the pre-Bush or especially the pre-Reagan tax structure. The thing that’s so crazy about China is they’ve sent all this money on ghost cities and bullet trains — but still, you can’t drink water out of the tap. At least, I would not recommend it. Really, what’s the point of all these sparkly vanity projects, if you still have to live with a 3rd world water supply? (sarcasm) From the viewpoint of culture, a new pinnacle of commercial postmodern equality and harmony has been reached in advertising of “natural” anti-snoring products whose significance remains as yet unmeasured by science. As one comment had it: the soldier might be slightly harder to locate with pin-point accuracy by enemies if he can stop his snoring problem naturally. We might not be celebrating infrastructure, but at least we can celebrate diversity in some extraordinarily meaningless ways! The libertarian perspective, in the sense that it reflects classical liberalism (medieval town charters and peasant’s rights reforms), is, IMO, vindicated in at least one areas of non-defense/non-police infrastructure spending: public education is highly ineffective and wasteful. According to John Taylor Gatto, the public education system in the USA was modeled on a German system designed to create compliant workers for drudgery in a system industrial state-capitalism. The natural enemies of such a system were agrarian populists, so public education was set up to destroy the small, independent, family farming economy, especially near urban markets via land taxes that economically stressed such near-subsistence farms. The result was the industrialization of farming in rural areas and the destruction of communities and culture. The “imperialist” element of the scheme was the destruction of communities. I would speculate that the rise of right wing religion is a result of the destruction of communities, and the lack of empathy by the urban liberal establishment, which created very deep alienation of independent agrarian populists from progressive culture. Suburban sprawl was necessary to convert such small/family farm lands to high-tax residential properties owned by new middle class participants in the post-industrial “office and information” economy. Critical thinking and creativity outside narrow social norms was highly discouraged, leading to a reactionary form of postmodern counterculture, narcissism and nihilism. If public education be be released from being “captured” by the forces of the american establishment’s imperialistic (community destroying) imperatives, and allowed to evolve a more decentralized model that allows for things like Holistic education, it has a valid role. Otherwise it will continue to be a huge waste, and a drag on necessary innovation toward decentralized, resilient and sustainable forms of culture. We live in the shattered fragments of a grand narrative of techno-economic progress that can no longer deliver on its promises, other than to a deeply corrupt “1%”. And those taxes were mainly allocated to the huge build up during the “boomer” generation, of suburban public education top-heavy with wasteful, conformist bureaucracies full of “social engineering” projects, aka “drop out factories”. Which spawned several generations of careerism and psychopathy, and severely polluted minds on the Left. The New Urbanists (such as Andres Duany and Christopher Alexander) have built up a significant body of information about the negative effect of suburban sprawl on quality of life, and they have a set of proposals for alternatives to the continued destruction of authentic culture and communities that “unsustainable” suburban sprawl represents. New Urbanism is in some ways consistent with the “anti-nanny-state” critique from the libertarian wing of the counterculture, which emphasized a return to self reliance, use of tools instead of reliance on social engineering bureaucracy, independence and communitarian values. What is necessary is a return to local wisdom and living communities that can rebuild a collective sense of meaning and purpose as an alternative to mass consumption and conformity. Public schools do exactly the opposite, and need to be abolished in their current form.